A practical floor unit that could easily serve as your sole onstage pedal while taking on practice and recording roles at home. Ability to assign any effect to each footswitch; comprehensive range of effects; Z-pedal; fairly compact size. Tube booster can't be recorded via USB. The Zoom G5's floor unit is larger than that of its precursor the G3, with five footswitches and a treadle. Editing is easy to get to grips with on the G5 pedal itself. Three knobs above each patch switch can tweak the effect selected. Last year, Zoom released the G3 - a multi-effects unit that combined ruggedness with simplicity of design and an endearing practical usability. What you got was a compact unit with 100 patches, each patch being made up of any three effects (or amp sims) chosen from the onboard selection. You could use the three footswitches to call up whole multi-pedal patches or to independently switch the three effects in any patch. "You can warp sounds in a way that could leave your audience open-mouthed." For all intents and purposes it provided you with 100 different pedalboard configurations, plus a 40-second looper and USB audio interface capabilities for less than £200. Needless to say, we concluded that it was an extremely versatile asset at a very nice price. Enter then, the G5, which takes the G3 concept and ramps it up a gear. The audio interface is still in place, the looper has been extended to 60 seconds and there's now a set of 40 onboard rhythm patterns - but the main difference is a larger (but not massive) floor unit with five footswitches and a treadle. This time there are 297 onboard patches in 99 banks of three, each patch being made up of as many as nine effects (dependent on the DSP limit). Four footswitches enable you to individually switch four of the effects in a patch while the fifth operates a 'tube booster' circuit, based around a 12AX7 valve that can be kicked in at any time for an extra 16dB of gain. Connections on the rear panel of the G5 enable you to use it with headphones for practice, connect to an amp (or other gear) via standard 1/4-inch jacks in mono or stereo, or send a signal (perhaps to a venue's front-of-house mixer) via a balanced XLR socket. Footswitches one to four control the main patch and effect selection on the G5, footswitch four being pivotal in that it changes between two modes when momentarily held down. In patch mode, the first three footswitches select the patch in each bank, while you can also scroll down or up through the banks by pressing footswitches one and two or two and three together. The displays above footswitches one, two and three show the name and number of the patches, while the fourth shows the bank number. Switching back to the normal default mode, the footswitches switch four effects in each patch in and out, while the displays show a graphical representation of each. Three knobs and three buttons under each LCD edit its related effect. Two buttons select the effect type, while a third scrolls through pages of adjustable parameters, three per page adjusted by the three knobs. Tweaking a knob displays the parameter value on screen. Editing is simple and it works. Now, the easiest way to use all this would be to solely use patches that have just four effects so you'd have instant access to all the switching and tweaking, but if you want a patch that has more than four effects, there's a pair of 'scroll' buttons that move the LCD displays along so you can see and edit up to a further five. You can footswitch whichever set of four consecutive effects in the chain that you see in the LCDs. To populate the patches, Zoom has provided 123 diverse types of stompbox effects, many based on well-known classics, plus 22 amp models with a mix of familiar oldies and newer contenders from the likes of Two-Rock, Carr and Krank among others. Similarly the factory patches (all overwritable) cover a nicely eclectic range, featuring a mix of practical generic tones and familiar song and superstar signature sounds (Smoke On The Water, Jimi Hendrix…) alongside barmy effects, more obscure songs and sounds from the likes of Allan Holdsworth, Jay Graydon and Grant Green. In addition there are a dozen banks, each programmed by Richie Kotzen and three other Zoom-approved players. Trying out the various patches it becomes apparent that the G5 can cover a wide sonic range, including enough vintage and modern amp tones to take care of most recording scenarios. They're made more realistic and playable courtesy of Zoom's newly developed sigmoid curve clipper, designed to recreate the smooth clipping of a valve amp's waveform. 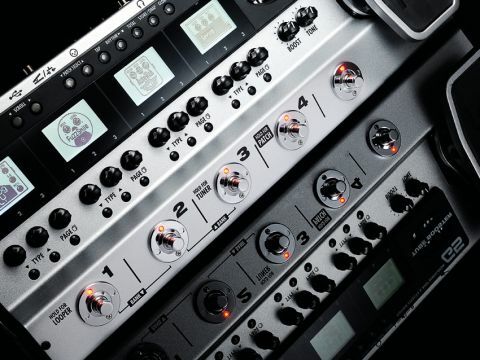 You may not need amp sims for onstage use but, among the effects types, there's little (if any) that Zoom has left out and you have complete control over which of these you choose to use in a patch and their order. In terms of extra control for live performance, two features stand out. The tube booster is independent of the patches in that its settings can not be saved to memory, but whatever patch you are using it offers the chance to kick things up a notch to let solos cut through. There's a knob to control the boost, bringing in a touch of gritty overdrive with extra emphasis dialled in by an EQ knob. The second unique performance feature is the pedal treadle, known as the Z-pedal, which offers both up and down and sideways motion, described by Zoom as 3D parameter control. You can assign up to three parameters in each axis of pedal movement, which will allow complex control of the sound. 20 of the onboard effects are specifically designed for use with the Z-pedal. In practice this means that you can warp sounds in a way that could leave your audience open-mouthed. There's a lot of power on tap with the G5, and it's a piece of gear that will find many uses. Just plug in a set of headphones and there are enough onboard amp and effects tones to suit silent practice in myriad styles, all enhanced by playing along to the rhythm patterns at whatever tempo you choose and/or employing the looper to jam with yourself. Recording to a computer via USB is dead simple too, and the bundled Cubase LE software means it's all at hand. A direct monitoring capability eliminates any latency problems. It's in live performance, though, that the G5 shows its mettle. If you only ever used one patch you'd have a pedalboard with tuner, four permanent effects (some of them perhaps under treadle control) and a booster. There are, though, 297 patches onboard, so there are options to create a different four-pedal pedalboard configuration for every song in your set or to create patches with more than four effects that can be called up where needed. With such operational flexibility, a comprehensive set of effects and the Z-pedal to throw in some unexpected spice, the G5 is a self-contained and versatile onstage pedal rig.